I've stayed in this hotel twice and both times i loved it! My first time i was only 13 so the hotel wasnt that fun for me as there isnt any entertainment but most the staff made me feel comfortable. The second time was the better stay! I was 16 and i took a friend! So if your my age take a mate! Well.... were do you start with this remarkable hotel. On arrival the first impessions were not good as it was very early in the morning and the place looked gloomy. There are actually two roman hotels in the same street ,same look and same owners. The hotel is theme based which I would decribe as a greek temple carry on film set with a touch of the Egyption thrown in. The room we had ,although a touch small was clean with plenty of hot water in a good bathroom. Plenty of fresh towels,clean comforable bed and a small balcony. The place is obviously a bit dated and tired and could do with a renovation,but its excellent value for money in an otherwise expensive place called Paphos- but thats another story. Back to the Roman, great little swimming pool which was not crowded, pleanty of sunbeds to go around and the best of all the staff are excellent-most being Russian who could not do enough for you and spoke good English. Only had breakfast once-the normal selection but not bad at all. All in all an excellent stay was had,clean and value for money. Hope you like mirrors if you give the place a try. We would'nt stay at the Roman hotel again if you paid us. On our 2nd day our hotel room was robbed while we were out, so be warned if you are staying at this hotel don't leave anything of value in your room.We had money stolen jewellery and worst of all our passports went. The manager wasn't very helpful.The rest of our holiday was spent either at the police station or in Nicosia at the British embassy. We were so glad to receive the money our daughter wired us so we could buy new passports. Avoid the Roman hotel like the plague. Both the Roman and its sister hotel Roman 2 are very well managed. Staff In both hotels are very helpful and polite. Swimming Pool is on roof with good views. Roof bar is small but is fine. The location is not really a problem as car hire is available or you can use local buses for only 75 Cents one way. Always check return times for the bus. Both the Roman and Roman 2 are a slow 20 min. stroll to the harbour with its restaurants and bars. There are plenty of old ruins to see, the Mosaics and Amphitheatre near the harbour are worth a visit, it's free on Sundays. BOOK YOUR HOLIDAY HERE IT`S WORTH IT! ! We spent two weeks at this very unusual hotel, the decor was amazing, murals and mirrors everywhere. All the staff were very friendly, the Barman has a very dry sense of humour but kept us amused for the whole 2 weeks. The rooms are quite spacious with an old but efficient air conditioning system, there is not a lot on the telly for the British (24hr news and Bonaza every evening)but it didn't matter as you don't tend to spend a lot of time in your room. The rooms were cleaned on a daily basis by a very efficient staff. The evening meals by the pool were very nice but breakfast was an awful buffet with hard eggs,and bacon that just didn't look or taste right. The swimming pool was very good, a decent size and no problem getting a sunbed any time of day. We would certainly stay at the Roman again. We stayed at the hotel for 1 week. The hotel is lovely. I have never stayed in one with such decor. For the first day or two we kept walking into mirrors. The rooms were really nice. We had one by the pool. The beds are huge and comfortable. We had no complaints about the hotel at all. The food was not to good but there were not many people so if you went into the restaurant late it was normally cold. The entertainment was awful. If this hotel was in a different place I would go again but not where it is situated now. Our opinion of the Roman when we first arrived was excellent, we were thrilled with our choice, the building itself is amazing, however I feel it is necessary to inform people of our less than amazing experience there. We have just got back from a week in Paphos (24-31 March 2004). We had visited Paphos in August 2002 and anyone that has been will know the Roman Hotel - it is on the corner of the road as the bus turns right to the harbour (coming from Coral Bay). It is hilarious. Have a look at their website and have a good laugh. All of this is beneficial. It's brilliant. My partner booked us a week here as my 30th birthday present as he thought it would be something to remember - and it is. Every inch of the walls in the hotel have roman murals on them, there are mirrors practically everywhere - in the bedrooms too! Apparently they used to be on the ceilings but so many people complained they had to remove these ones, ha ha ha. It is rather dark in the hotel but this is how it's meant to be, it's part of the ambience. The pool area is quite small and I'm sure would be very cramped in the height of summer but it was fantastic this time of year. There is a pool bar serving snacks and huge ice cream sundaes! The pool is open to the public as long as they eat and drink there and we thought this might cause a problem but it didn't, there were plenty of sunbeds and room (yes, it was hot enough to sunbathe - came back with a good tan). The hotel was always being cleaned, there seemed to be as many maids as guests! We were b&b and the buffet breakfast was very good quality. There was everything from croissants to cooked breakfasts. We were told that we were approximately a 20 min walk to Paphos harbour but thought that this would take longer as I walk VERY slowly - on our first night there I was convinced to walk to the harbour and timed us - it took 9 mins! And that's a slow walk... The hotel staff were very friendly and helpful when asked, although we didn't need to bother them often. There was something going on in the restaurant for entertainment every night but we never stayed (reflected in the low mark given, not because it was bad). There didn't seem to be many people in there each night but it was out of season. 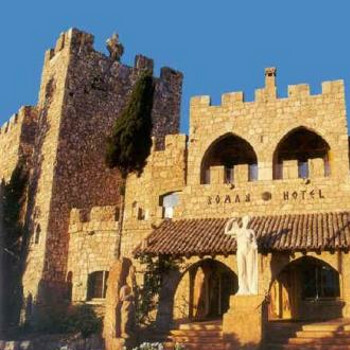 I would definitely go back to the Roman Hotel, it was a great experience.